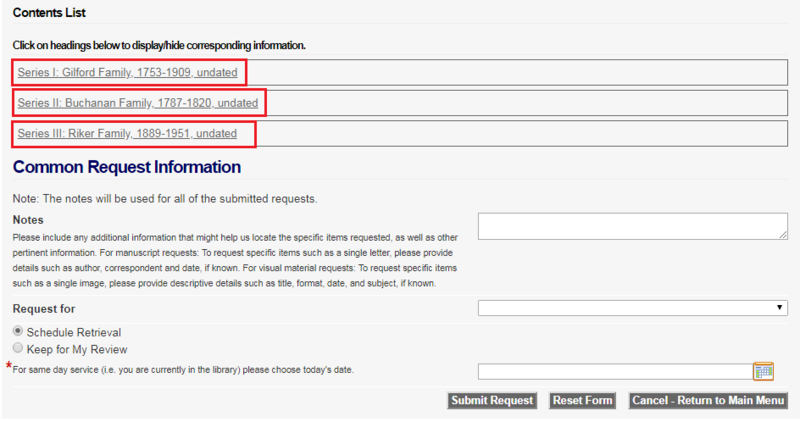 When you've decided which boxes and folder you'd like to request, click "Click here to request materials using your Collections Request Account." A surrogate of the finding aid will be created once you log in to your account, requests can be made there. You will be brought to the login page (if you are not already logged in.) Enter your username and password as you normally would. New users should proceed with the registration process; the item you requested will still be pending until you complete the registration process. 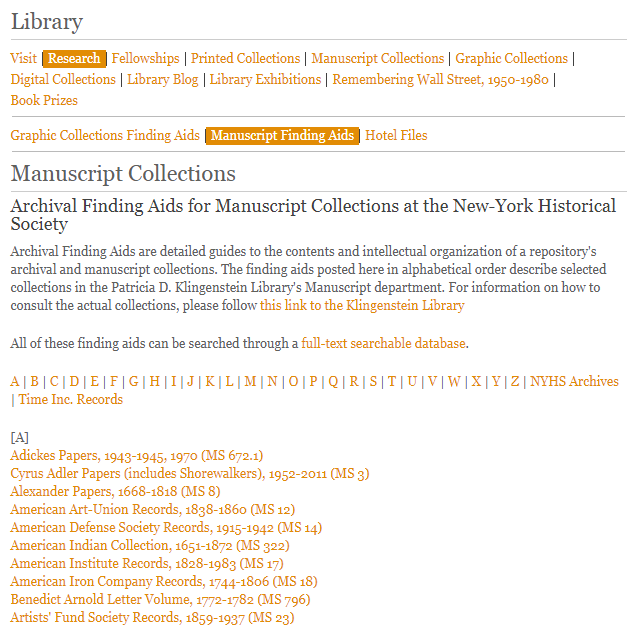 Upon logging in, the finding aid will be reproduced. Click on the check box next to the box you would like to request. Instead of requesting a whole box, you can also request specific folders by clicking on the title "Box" to further open the collapsible field, this allows you to request individual folders. Fill out the remaining fields of the request form once you have marked the check boxes you need. The "Notes" field is for specific instructions, such as if you are looking for a specific image or document. Remember to select a scheduled date by clicking the small calendar icon, since this information does not automatically populate. Also, please remember that selecting "Keep in Review" places your request in a private holding queue that the librarians cannot see, and therefore will be unable to process your request. 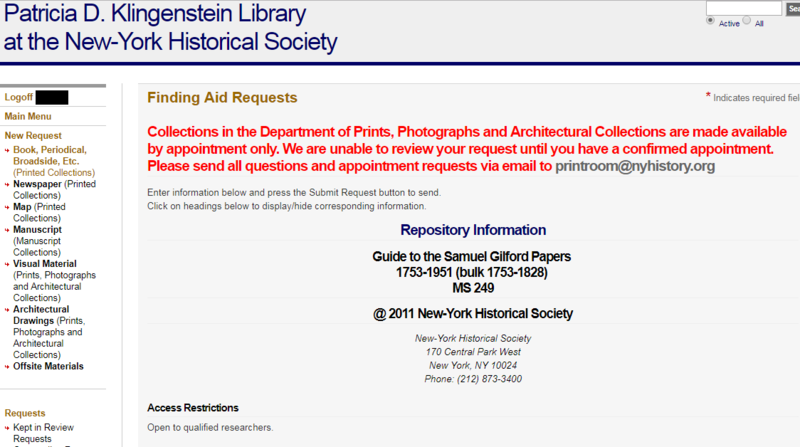 Once you click "Submit Request", your request will be routed to the proper library department for processing. Please note that your items will not be paged until you speak with a librarian. Please provide them with your username or the transaction number (or both). This will expedite the processing of your request. 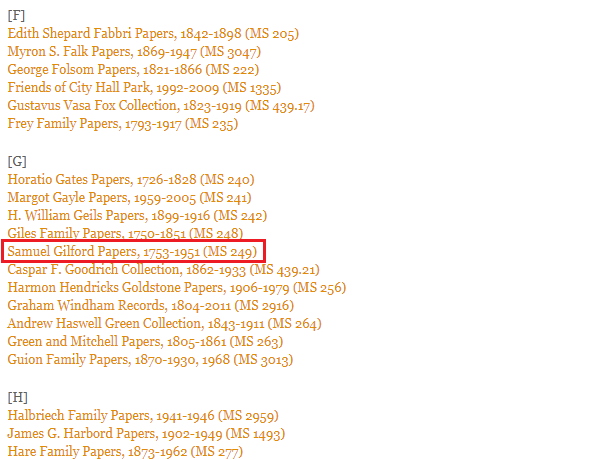 Also note the "Status" highlighted below; this will let you know which department your request was sent to.